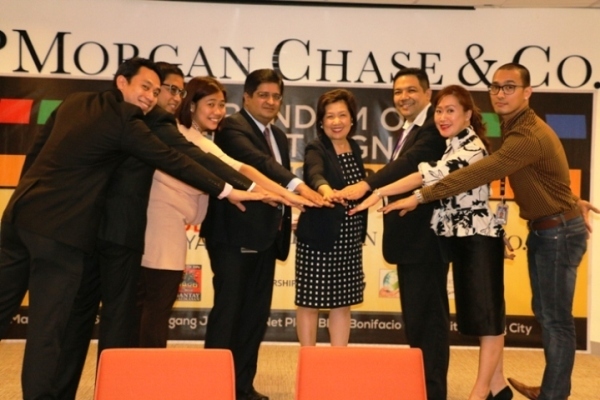 ABS-CBN Lingkod Kapamilya Foundation recently signed an agreement with leading global financial services firm JPMorgan Chase & Co. in support of the former's Bantay Langis - Bantay Kalikasan program. With the aim of helping to recycle partner organization’s used oils, the Bantay Langis project hopes to reduce the hazardous effects that used oils may bring to the environment. In 1st Photo: (L-R) Francis Liwanag- Senior Facilities Manager-Engineering Manager, ,JLL,JPMorgan Chase & Co.; Emilio D. Amaranto-Legal Head, JPMorgan Chase & Co.; Michaela Flamengco-Lagat-PFAM Manager, JPMorgan Chase & Co.; Sandeep Mulajkar- Chief Administrative Officer, PhilippinerJP Morgan Chase & Co.; Susan B. Afan- Managing Director of ABS-CBN Lingkod Kapamilya Foundation, Inc.; Michael F. Magpusao- Global Real Estate Executive Officer, JP Morgan Chase & Co.; Pixie N. Javier-Gutierrez, JP Morgan Chase & Co. and Paul Vincent Mercado-Chief Marketing Officer,ABS-CBN Lingkod Kapamilya Foundation, Inc.
“Our partnership with ABS-CBN Lingkod Kapamilya Foundation, Inc. over the past years in support of their Bantay Kalikasan projects align with our efforts to care for the environment we live and operate in. It also bolsters our firm's Corporate Responsibility efforts in the country” said Sandeep Mulajkar, Chief Administrative Officer, JPMorgan Chase & Co. - Philippine Global Service Center. On the other hand, ABS-CBN Lingkod Kapamilya Foundation’s Managing Director Susan B. Afan articulated the importance of wastes and scraps of various companies where ALKFI can make something productive out of it. JPMorgan Chase & Co. has been one of the notable partners of Bantay Baterya and Bantay Langis projects of Bantay Kalikasan for the past three years. JPMC worked together with ALKFI in 2015 through its Bantay Baterya project.